The collecting of swords and edged weapons has been both a hobby and business for me over many years. 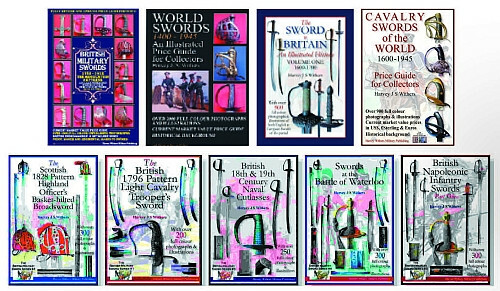 It has been a fascinating experience and one that has enabled me to handle thousands of British swords and edged weapons. One thing that strikes me first is the sheer variety of edged weapons that Britain has produced. We have a long and distinguished martial history and the production and use of the sword has always been an important element in the portrayal of the typical British soldier, both officer and enlisted man. The carrying of a sword by a British officer signified their status and rank and before the introduction of the machine gun and mechanised warfare, the use of a sword whether it be on the battlefield or on board a ship of the line, was a symbol of an officer's leadership and personal courage. In these modern times when long distance warfare is the norm and an enemy might never be seen before the kill, it is important to note that the sword was a weapon of close quarter and the injuries suffered from its use were horrific and rarely saveable. If a collector buys an antique sword and admires its fine workmanship and lines (as we all do) it must also be remembered that it had a primary function to kill or maim an opponent and the sword that you have in your hand might just have done that many times. If you are lucky enough to be resident in the United Kingdom, there are many opportunities to source British swords and edged weapons. One of the most accessible are antique arms fairs. There is normally one being held most weeks somewhere in the country and they range from the village hall to the convention centre. A good reference for when and where these fairs are being held is the Armourer magazine - here. They list all the fairs in the UK that are being over a few months and it is handy for noting in your diary and planning your visits. The magazine is also a good read for the sword and militaria collector! Antique arms fairs are a great opportunity to source British pieces and importantly, actually handle and examine what is for sale. Even if you don't see what you are looking for or the price is out of your budget, pick up the sword (making sure that you ask for permission to do so) and have a good look at it, noting the way it has been manufactured, the patination and general condition. Make a mental note of what you have seen and store it for future use, especially the price as similar swords, particularly official patterns, tend to sell for an average price and you do not want to be paying way over the odds for an ordinary piece. At the end of the day, experience always counts and you will no doubt buy some "howlers" in your time and learn accordingly - we have all done it and continue to do so! Antique swords and edged weapons can also be acquired from auction houses and give the buyer an opportunity to purchase swords that might have been in a family for many generations. They are also used by dealers to sell their unsold stock and some pieces can go on a merry-go-round as they feature in different auctions. The same can be said for antique arms fairs as pieces are sold between dealers and moved from one table to another (invariably with a higher price!). Auction houses used to be a reasonably economical method of acquiring items but in the last couple of years (and I speak of British auctioneers) the commission charged has risen steeply and has become quite a sizeable chunk of the overall price paid for a piece. If you are happy to take that "hit", then fair enough but always factor in the commission when considering what your highest bid should be - if you are spending several hundred pounds, a commission over 20% can be quite a sum.